To be effective, it is important to offer consistent support both during and after imprisonment. However, programs involving family during pre-release preparation and after release have been scarce and have been subject to limited evaluation (e.g., Bobbitt & Nelson, 2004). A thorough review of programs to assist with prisoners post-release did not include any that focused on partner or father-child relationships (Seiter & Kadela, 2003). Additionally, one study found that only 8% of fathers participated in parenting skills programs during the year after their release from prison (Visher & Courtney, 2007). Family involvement in post-release programming is associated with decreased drug use, fewer physical and emotional problems, and decreased recidivism among fathers. Some research on family support programs after release has found that family involvement in programming is associated with positive outcomes, including decreased drug use; fewer mental, physical, and emotional problems; and decreased recidivism (Visher & Travis, 2003). As mentioned above, La Bodega de la Familia, which provided crisis intervention and case management services to drug abusers involved in the criminal justice system and their families through release, found reductions in drug use and recidivism and improvements in mental health functioning (Shapiro, 1999; Visher & Travis, 2003). Qualitative and quantitative interviews with 49 prisoners within the first month of their release indicated that families provided critical material (i.e., food, housing, and money) and emotional support, which was related to their post-release success in remaining drug-free and finding employment and stable housing (Nelson, Deess, & Allen, 1999). These studies indicate that it is important to involve families prior to release in order to put together a reentry plan (Bobbitt & Nelson, 2004; Festen et al., 2002). The family members typically involved in such programs have been parents, siblings, and other relatives of the offender; more effort is needed to involve spouses or intimate partners (Bobbitt & Nelson, 2004). For instance, Kaslow (1987) recommended addressing plans for reentry into family roles and relationships in the context of couples’ therapy with incarcerated parents. Further efforts to involve family in reentry and post-release programming are underway. For instance, Project Greenlight is a pilot program in New York City that involved four weeks of family reintegration sessions focused on couple, co-parenting, and family-of-origin relationships. Sessions were conducted by a family counselor during pre-release preparations, and have since been provided in the community after release (Bobbitt & Nelson, 2004). The Ohio Department of Rehabilitation and Correction is working to enhance family involvement in the continuum of incarceration, reentry, and post-release services by developing a Family Orientation Program at each reception center to provide information to families during incarceration, involving families in post-release supervision visits, and creating a Family Council to address family issues across the reentry continuum (La Vigne, Thomson, Visher, Kachnowski, & Travis, 2003). The Community Orientation and Reintegration (COR) program in Pennsylvania involves parenting education and reunification preparation during incarceration, individual and group counseling sessions around parenting skills and family strengths, and facilitation of family reunification in community corrections centers (La Vigne, Lawrence, Kachnowski, Naser, & Schaffer, 2002). 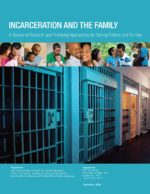 Although process evaluations suggest that these programs are making strides toward meeting prisoners’ needs for family involvement and reunification, outcome evaluations have not been conducted to assess the efficacy of such programs in promoting family strengthening and enhancing post-release success. Other types of programs for returning prisoners and their families that may be applicable to marriage and family strengthening efforts include diversion programs that help fathers pay child support; faith-based programs that connect fathers to services upon release; support groups for fathers’ partners; mentoring programs to support children of incarcerated fathers; and services that address more basic needs such as housing, food, and employment. Crossover between these efforts is needed to best support couples and families after fathers return to the community (Bauer et al., 2007).